This book brings together over 300 important readings on religion in modern times, offering a new framework and language for making sense of religion today. Linda Woodhead is Lecturer in Christian Studies at Lancaster University. Until recently she was Editor of Studies in Christian Ethics, and she is currently Review Editor of Modern Believing and a co-editor of Cultural Values (Blackwell Publishers). 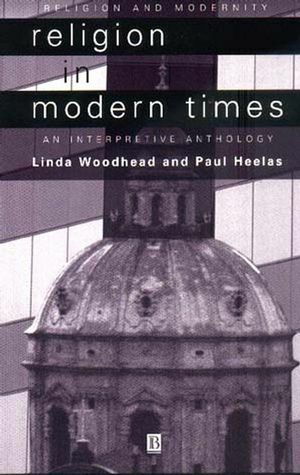 Paul Heelas is Professor of Religion and Modernity at Lancaster University. He is the author of The New Age Movement (Blackwell Publishers, 1996) and editor of Religion, Modernity and Postmodernity (Blackwell Publishers, 1998). 2. Tipton's Four-Fold Analytical Scheme. 4. Voll: 'Styles of Action' In Islam. 5. Bellah's Characterization of Religions of Difference. 6. Otto: 'The Idea of The Holy'. 7. Chesterton Commends Metaphysical Difference. 8. Mcguire on Dualism In The Roman Catholic Church. Theme (II): Communities of Difference:. 9. Troeltsch's Distinction Between Church and Sect. 10. The Doctrine of Papal Infallibility, 1870. 11. Heilman: The Authority of Tradition In Ultra-Orthodox Jewry. 12. Heilman: The Authority of Text In Ultra-Orthodox Jewry. 13. Antoun: Muslim Fundamentalism Rejects Tradition In Favour of Text. 14. Toumey on Science, Creationism and The Bible. Theme (IV): Sin, Evil and Redemption:. 15. Barth on The Wrath of God. 16. Hal Lindsey: Escaping This Evil Age. Explanation (I): Reaction to Modernity:. 17. Hallencreutz and Westerlund: Fundamentalism As A Revolt Against The Modern Age. 18. Voll Explains Islamic Fundamentalism As A Reaction to The Failure of The West. Explanation (II): Refuge From Pluralism, Atomization Or Anomie:. 19. Ammerman Explains Fundamentalism As A Refuge From Change and Chaos. 20. Hegland Challenges The Anomie Thesis. Explanation (III): Provision of Social, Moral, Cultural, and Transcendent Capital:. 21. Greeley on Social Capital. 22. Ammerman on Moral and Spiritual Capital. 23. Hefner on Transcendent Capital and The Potency of Difference. Explanation (V): Dependence and Equality:. 25. Warner on 'The Culture of Public Humbling'. 26. Roof and Mckinney: The Growth of Heightened Difference. 27. Hunter on The Inevitable Liberalisation of Religions of Difference. 28. Martin: The Difficulty of Sustaining Heightened Difference. 29. Troeltsch on The Necessary Transformation of Religions of Difference. 30. Voll: Religions of Difference Wax and Wane. 31. Ahlstrom Introduces Christian Liberalism. 32. Kopf on 'Rational Faith' Religion In India. 33. Ammerman on 'Golden Rule' Christianity. 34. Gay and Early Rationalist Criticisms of 'Tradition'. 36. Woodhead: Demythologization on The Basis of 'Experience'. Theme (II): Humanity and Human Freedom:. 38. Passmore: 'The Perfectibility of Man'. 39. The Dalai Lama: 'Human Nature Is Basically Good'. 40. Radford Ruether: 'The Promotion of The Full Humanity of Women'. Theme (III): Ethicization and Politicization of Religion:. 41. Rammohun Roy: An Ethical Religion to Unite Mankind. 42. Esack: Islamic Liberation Theology. 43. Young on Evolutionary Optimism. 44. Nehru's Religion of Progress. Explanation (I): Capitulation Or Accommodation to Secular Culture:. 45. Berger: 'An Immense Bargaining Process With Secular Thought'. Explanation (II): The Cultural Logic of Protestanism:. 46. Troeltsch: Luther As The Founder of Religious Subjectivism. Explanation (III): Detraditionalization and The Flight From Authority:. 47. Mcleod: Freemasonary and Social Change. 48. Hofstadter: Christian Liberalism As Social Protest By Clergy. Explanation (V): The Quest For Human Unity:. 49. Seager: Religions of Humanity As A Response to Colonial Difference. 50. Roof and Mckinney: Declining Numbers, Steady Influence. 51. Bruce: Liberalism Cannot Sustain Itself. 52. Roof: Evolution of Liberalism. 53. Gaustad: Religions of Humanity Undermined By The Collapse of Modernist Assumptions. 54. Gee: Can Religions of Humanity Adapt to Marginalization and Pluralization?. 55. Larson and The Continuing Influence of The Liberal Ideal In India. 59. Troeltsch: Inner Spirituality In Historical Context. 61. Farmer and The Self. 62. Harding and 'The Ultimate In Self-Reliance'. Theme (III): Women, Essentialism and Anti-Essentialism:. 68. Maeda on Spirituality After Deconstruction. 70. Taylor and 'Terminal Faith'. Explanation (I): Failures of The Mainstream and The Turn to The Self:. 71. Berger, Berger and Kellner and The Self As The Source of Significance. 72. Tipton on Addressing Cultural Conflict. Explanation (II): The Expectancies of The Self. 73. Taylor and 'The Massive Subjective Turn of Modern Culture'. 74. Shils and The 'Uncontaminated Self'. 75. Roof and Gesch: Baby-Boomers and Nuturing The Self. 78. Inglehart and Postmaterialist Values. 80. Cupitt: Self Spirituality Without A Self?. Experiential Religions of Difference (Evangelical-Charismatic):. 81. Bebbington: Scripture and Experience As The Twin Authorities of Evangelicalism. 82. Tipton: Order and Ecstasy In Counter-Cultural Christianity. 84. Martin on The Charismatic Upsurge. 85. Tagore's Experiential 'Religion of Man'. 86. Robinson: God As 'The Inter-Personal'. 87. Woodhead: Princess Diana's Tender-Hearted Humanitarianism. 88. Religious Synthesis In A Course In Miracles. 89. Wuthnow on The 'Great Fracture' In American Religion. 90. Chesterton Defines Christian Orthodoxy Over Against Theosophy. 91. Runcie on The Contradictions of Prince Charles's Religion. 92. Berlin on Ultimate and Unresolvable Value Clash. 93. Weber on The Importance of The Economic In Religion. 94. Weber on 'Economic Ethics'. 95. Jomo Summarizing 'Islamic Economic Alternatives'. 97. Tawney and The Religious Critique of The Economic. 98. Giddens Summarizing Weber's 'Protestant Ethic' Thesis. 99. Estruch and A Catholic Work Ethic Today. 101. Schneider and Dornbusch: Prosperity Religion Today. 103. Ray: 'Let The Divine Plan of Your Life Manifest Itself'. 104. Sivananda: Prosperity In India. Example (III): Responses to Deprivation:. 105. Marx and Engels In Critical Mood. 106. Bruce and The Appeal of Prosperity Christianity. 107. Lewis: Spirit Possession As A 'War Between The Sexes'. 109. Lienhardt and Cargo Cults. 110. Levine and 'Masterless Men'. 111. Berger Portraying '"Schools" For Social Mobility'. 112. Bell and The Fate of The Protestant Work Ethic. 113. Hunter: Evangelicals and The Secularization of Work. 114. Rose and The Resacralization of Work. 115. Thrift and New Age Management Trainings. 116. Martin: Latin American Pentecostalism and 'New Social Capital'. 117. Gifford and Prosperity In Africa. 118. Tipton and Zen 'Ectopia'. 119. Martin Differentiates The Religious and The Political. 120. Hallencreutz and Westerlund: A Typology of Relations Between State and Religion. 122. Casanova on The Deprivatization of Religion In Modern Times. Example (I): Religious Nationalism and Theocracy:. 123. Gardell Defines Religious Nationalism. 124. Juergensmeyer on The Rise of Religious Nationalism. 125. Martin Outlines The Circumstances Under Which Faith and Nation Unite. 127. Haynes: Is Islam Always Theocratic?. 128. 1864: The Roman Catholic Church Condemns Modern Liberalism. 129. Chaudhuri: The Moral and Religious Basis of Gandhi's Opposition to British Rule In India. 130. Bennigsen: Sufi Resistance to Communism. 131. Martin on The Role Played By The Churches In Opposing Communism In Eastern Europe. 132. Levine on Liberation Theology In Latin America. 133. Nicholls: Images of God May Subvert Or Legitimate Political Authority. 134. Rousseau and Civil Religion. 135. Bellah: Civil Religion In America. 136. Nicholls on Christian Legitimations of Nazism In Germany. Example (IV): Religion At The Origins of The Modern State:. 137. Troeltsch on The Religious Origins of Modern Freedom. 138. Parsons: Modern Democracy As The Institutionalization of Protestantism. 139. Smart: Maoism As A Religion. Example (V): Public Roles of Religion Within Liberal Democracies:. 140. Martin: Differentiation and The Redistribution of Secular and Sacred Space. 141. Conway on The Course of Political Catholicism In Europe. 142. Haynes: 'The New Political Catholicism'. 143. Wuthnow: The Rise of The New Christian Right. 144. Roof and Mckinney: The Influence of Black Churches on American Politics. 145. Neuhaus: Putting Religion Back Into The 'Naked Public Square'. 146. Martin: Pentecostalism and The Political Significance of The Apolitical. 148. Casanova: Religion Before The Juggernaut of Modernity. 149. Fenn: The Diffusion of The Sacred. 150. Neuhaus: Religion and The Survival of Liberal Democracy. 151. Bellah Hopes For An International Civil Religion. 152. Juergensmeyer: The Onward March of Religious Nationalism?. 153. Giddens: From Emancipatory Politics to Identity Politics. 154. Hall: Open and Prescriptive Difference. 155. Said: The Oriental 'Other'. 156. Heelas: Religion and Postmodern Difference. 157. Pius XI: Women's Difference. 159. Daly: Post-Christian Insistence on Women's Difference. 160. Jacquelyn Grant: 'Black Women's Jesus'. 161. Davidman on Jewish Women Seeking 'Traditional' Differentiated Gender Roles. 162. Ahmed: The Return to The Veil As A Source of Empowerment. 163. Cucchiari: Pentecostalism and The Domestication of Men. 164. Marler: Family Breakdown/Church Breakdown. 165. Lehman: Differences Between Women and Men In Ministry. 166. Comaroff and Comaraff: Women As 'Signs and Ciphers' In Africa. 167. Van Der Veer: Women As 'Signs and Ciphers' In Pakistan. 168. Hobsbawn on Interrelations Between Religion and Ethnicity. 169. Voll: Ethnicity and Islam. 170. Mullins: Religio-Ethnic Mobilization In Korea. 171. Gardell on Race Ideology and Religious Nationalism. 172. Danzger on Difference and Jewish Identity. 173. Trigano on The Holocaust and Jewish Identity. 174. Hunwick: Post-Colonial Reassertion of Religious Difference. 175. Wuthnow: Diversity In Small Group Spirituality. 176. Starhawk on Inventing Religion Without Absolutes. 177. Martin: The Idea of Unity As The Big Idea. 178. Clarke: The Tension Between Universalism and Difference. 179. Hammond Summarizing Secularization As A One-Directional Process. 180. Bell and 'Enlightened Thinkers'. 181. Jameson: The Disappearance Thesis That Religion Is Already Dead. 182. Wilson: The Differentiation Thesis That Religion Has Lost Its Public Significance. 183. Martin and The Coexistence Approach: Secularization and Vitality. 184. Brierley and Wraight on Declining Church Membership. 185. Hadaway, Marler and Chaves on Halving Church Attendance In The United States. 186. Hunter and The Fortunes of Evangelicalism. Explanation (I): The Triumph of Secular Reason:. 187. Kant on The 'Courage to Use Your Own Understanding'. 188. Gerth and Mills Summarizing Weber on Rationalization and Disenchantment. 189. Wilson and The Role Played By Science. 191. Marx's 'All That Is Solid Melts Into Air'. Explanation (III): Differentiation and The Growth of The Secular State:. 193. De Tocqueville and Equality. 194. Casanova on The Privatization of Religion As Constitutive of Western Modernity. 195. Berger: 'Certainty Is Hard to Come By'. 196. Martin: 'The Breaking of Bonds In General'. Explanation (V): The Turn to Consumerized Experience:. 198. Lasch and 'Orgiastic, Ecstatic Religiosity'. 199. Wilson and 'Pushpin and Popcorn'. 201. Troeltsch: on The Value of 'This Present Life'. 202. Simmel: 'This Wholly Formless Mysticism'. 203. Bellah: '.Without Imposing . A Prefabricated Set of Answers'. 204. Bellah Et Al. : 'Sheilaism'. 205. Radhakrishnan: Mysticism As The Escape From Tradition. 206. Beckford on Postmodern Religion. Example (I): The Radically Detraditionalized:. 207. Adams and Haaken: 'Anticultural Culture'. 208. Kopp: 'Killing The Buddha'. 209. Jayakar: Krishnamurti and 'Truth Is A Pathless Land'. 210. Christ, Starhawk and The Nature of The Goddess. Example (II): The Less Radically Detraditionalized:. 211. Stanton: 'The Golden Rule'. 212. Miller and The New Paradigm Churches and 'A Middle Course'. 213. Durkheim on 'A Free Private, Optional Religion, Fashioned According to One's Own Needs'. 214. Casanova and 'The Cult of The Individual'. 216. Beckford: 'Religion Has Come Adrift From Its Former Points of Anchorage'. Explanation (I): The Turn to The Detraditionalized Self:. 217. Heelas Summarizing The 'Standard' History of The Turn to The Self. 218. Simmel: 'The Subjectivism of Modern Personal Life'. 219. Gehlen and The Development 'Of The Psyche Itself'. 220. Hunter, Evangelicalism and 'Fascination With The Self'. Explanation (II): Freedom and Choice:. 221. Bell: 'All Is to Be Explored'. 222. Bloom: Not 'Don't Do That!'. 223. Wuthnow and 'Religious Populism' In The USA. 224. Berger: 'The Necessity to Make Choices As to Beliefs'. 225. Voye and Dobbelaere: Bricolage 'Beyond Secularization'. Explanation (III): The Impact of Democratization and Universalization:. 226. De Tocqueville, Democracy and Religion. 227. Hatch, Democracy and Religion. 228. Casanova: Catholicism and 'A Universalistic Language'. 229. Herberg's 'American Way of Life'. 230. Wuthnow and Declining 'Tensions'. 231. Wilson on Britain and The 'Marginally Different'. 233. Heelas Summarizing Differentiation and Dedifferentiation. Example (I): Religions of Difference:. 235. Bahr on Shifts to The More Liberal In Middletown. Example (II): Religions of Humanity:. 236. Bonney: The World's Parliament of Religions and The 'Golden Rule'. 237. Kung: 'True Religion Is The Fulfilment of True Humanity'. 238. Gillman: Quakers and 'Why Have Membership At All?'. 239. Tagore and 'Messengers of Man'. Example (III): Spiritualities of Life:. 240. Emerson and The 'Beatitude of Man'. 241. Beckford and Holistic Spirituality. 242. Gandhi and 'The Permanent Element In Human Nature'. Explanation (I): Detraditionalization and The Turn to Humanity:. 243. Heelas on Explaining Links Between Detraditionalization and The Ethic of Humanity. 244. Toulmin and The 'Religious Wars'. 245. Niebuhr on 'The Road to Unity'. 246. Rolland Reacting to 'This Shameful World War'. 247. John Paul II Responding to Difference. 248. Hefner and A 'Shared National Culture' In Indonesia. 249. Parel: Gandhi's Search For 'National Integration'. 250. Berger and Responses to Competition In The Market. Explanation (III): Democracy and Equality:. 251. De Tocqueville: Equality and 'The Unity of The Creator'. 253. Wuthnow, Toleration and College Education. Explanation (IV): The Role Played By Capitalism:. 254. Gellner and The Egalitarian Outlook. 255. Bruce: 'Modernization' and 'Fundamental Egalitarianism'. 256. Casanova on 'A Radical Change In Intellectual Climate'. 257. Berger: Secularization Theory As 'Essentially Mistaken'. 258. Casanova: Religion and 'The Ongoing Construction of The Modern World'. 259. Haynes, Deprivatization and The Discontents of Modernity. 260. Warner and 'American Exceptionalism'. 261. Hoover Summarizing The Growth of Religion In Middletown. Example (I): Religions of Difference V. Religions of Humanity:. 262. Berger and The Rise of Religions 'Dripping With Reactionary Supernaturalism'. 263. Voll and Dynamic Islam. Example (II): Experiential Religions of Difference:. 264. Hunter: Evangelicalism In The USA As 'Far From Pale and Lifeless'. 265. Miller: 'A New Era of Postdenominational Christianity In America'. 266. Lewis on A 'Significant Cultural Shift'. Example (IV): Vitality Beyond Institutionalized Religion:. 267. Heelas on Growth Beyond Church and Chapel. Explanation (I): Religions of Difference:. 268. Casanova, Deprivatization and The Critique of Modernity. 269. Bruce: Religion, Cultural Defence and Transition. 270. Hefner: Gellner, Islam and The Nation-State. 271. Elphick: Rapid Change In South Africa. 272. Kelley and 'The Essential Function of Religion'. 273. Berger on The Quest For Certainty. 274. Stark: Pluralism and 'Creating A Demand'. Explanation (II): Experiential Religions of Difference:. 275. Miller: Why Are The New Paradigm Churches Growing?. Explanation (III): Spiritualities of Life:. 276. Berger: 'Modernization and Subjectivization Are Cognate Processes'. 278. Luckmann: A 'Profound Change In The "Location" of Religion In Society'. 279. Stark and Secularization As 'Self-Limiting'. Explanation (IV): Significance Beyond Institutionalized Religion:. 280. Heelas and Constructing Autobiographies. Explanation (V): The Need For Religion, and The Future:. 281. Bell and The Return of The Sacred. * Includes over 300 readings looking at religion's encounter with the forces of modernization. * Takes a global approach. * Explores the opposing dynamics which characterise religion in our times.